Which dams are being considered for removal? The Gorge Dam and the Brecksville (Route 82) dams are currently being studied for removal. Dams in Kent, Munroe Falls and Cuyahoga Falls have been bypassed or removed. What are the benefits to removing dams? Improved water quality – a free flowing river is a cleaner river with higher levels of dissolved oxygen. When the Kent Dam was bypassed the river in that area achieved full attainment of all water quality standards within three months. Improved fish habitat – A free flowing river has a larger and more diverse fish population as shown by Ohio EPA studies of the Cuyahoga. Native fish are able to migrate further upstream providing increased opportunities for fishermen. Increased public spaces and recreational opportunities – The restored Gorge will contain world-class whitewater that kayakers must now travel many miles to experience. New hiking opportunities will be available in the Gorge. In Kent and Munroe Falls the lower water levels exposed submerged land that has been turned into highly used public park land. Removing Gorge Dam will reveal 32 acres of currently hidden parkland. Scenic beauty – In the late 1800’s the Gorge was home to High Bridge Glens Park. Up to 10,000 visitors a day came to see and experience its spectacular beauty. A restored Gorge will once again one of the most beautiful places in Ohio. Economic development – All of the above benefits add up to more visitors to the Gorge and the surrounding area. This will support existing businesses that cater to the visitors and spark the creation of new businesses to provide services for the influx of visitors. Do these dams have any current beneficial uses? The original purposes of these dams no longer exist. The Gorge Dam was created to provide water for power plants that no longer exist. The Brecksville Dam was created to provide water for the Ohio & Erie Canal. A pumping system is being studied to provide water for the canal if and when the dam is removed. Neither dam provides any flood control. Could the Gorge Dam be used to provide hydroelectric power? The dam was built in 1914 to provide hydroelectric power. The flow of the Cuyahoga proved too unreliable and operation was ceased in 1958. Since then the possibility of using the dam for hydropower has been studied and abandoned. This occurred most recently in 2009. How much will removing the dams cost and who will pay for it? The current estimate is that removing the Gorge Dam and all of the sediment trapped behind it will cost about $70 million. The money would come from a combination of federal, state and local sources. Removing the Brecksville Dam will cost about $1 million. $900,000 of that cost is currently available. What will the Gorge look like after the dam is removed? Where the dam is now were once the Great Falls of the Cuyahoga. The Gorge will be one of the scenic wonders of Ohio. 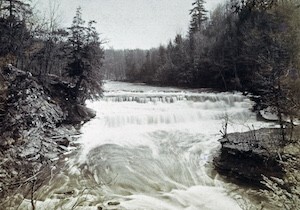 The best way to see what the Gorge will look like is to consult Mary McClure’s book, High Bridge Glens of Cuyahoga Falls, which contains many historic photos of the Gorge before the dam was built. How can I get involved or support the removal of the dams? Contact Friends of the Crooked River to receive updates on public meetings that will be held about the removal of the dams. You can email us at ohgreenway.org or call us at (330) 666-4026. Visit our web page, cuyahogariver.net, or visit our Facebook page. Please become a member and support our efforts to restore the Cuyahoga. FAQS compiled by Friends of the Crooked River.